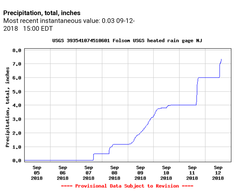 Over the past few days Western portions of Hamilton Township have received over 7" inches of rainfall. We have also been notified that dams above Hamilton Township have been opened to release excess water. All available flood gates in Mays Landing have been opened. As a result, the level of Lake Lenape will actually be lower than normal for a short time. By this afternoon flood water will reach the Lake and the level will rise significantly. Residents along the River and Lake should prepare for Moderate flooding through the weekend and into next week.